Last year, Nancy Stordahl challenged her readers and fellow bloggers to share 15 random facts about themselves (to read my old list, click here). Now she is challenging us again! And since I had so much fun the first time, I’ve decided to share more about me with all of you. I hope you’ll take some time to share some random facts about yourself too. 1. I am not afraid of clowns. In fact, I love clowns! I think they are misunderstood. 2. I was MVP of both my high school and college varsity volleyball teams. I even got the game ball once and I still have it. I was pretty athletic through my years, and got cancer anyway. 3. I’ve read “Of Love and Other Demons” by Gabriel García Márquez (my inspiration for writing) 4 times, and have cried every time. I am hoping that next time I read it, I won’t cry. There are just some things about the main character that remind me of my life. 4. When I was a child, I would steal flowers from different houses to bring to the cemetery near my house and I would place the flowers on the graves that didn’t have markers. 5. I used to climb the fruit trees in our yard and sit on the roof of my house to eat mangoes and guavas. Every day. I would try to get the mangoes off the trees with a long stick (from the roof) and it was difficult to keep my balance. This made my grandmother very nervous. But I never fell. 6. I was called Pink Panther in fifth grade because I was the tallest girl in class and had long skinny arms. 7. I had all my adult teeth by the time I was 8 and all my wisdom teeth by the time I was 18. 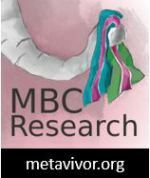 A lot came too early in my life, including breast cancer. 8. I talked a lot when I was a child, so much that I was often offered money or other bribes to be quiet for a while. 9. When I was around 9 years old, I met Ramona, a fortune teller who was mute. When she read my left palm she stated, in writing, that I was going to have serious health problems very young and I was going to have infertility issues, but that I would have one child when I was closer to my 40s. (Not bad fortune-telling.) I recently found Ramona on Facebook. And no, I did not request her as a friend. 10. I have a cat who I named after my grandmother. She also shares my grandmother’s birthday. 11. I don’t own a smart phone. I have a dumb phone and I am very proud of it. 12. I love Charlie Chaplin and enjoy watching black and white movies. In this collection, you can see some of my pets: Bingobella, Basil, Layla, Angel, Goofy, among others. 13. If I had to choose a favorite city to live it will have to be Montreal Quebec. I love the food, the people, the arts and atmosphere. I feel like I am home every time I go there. 14. 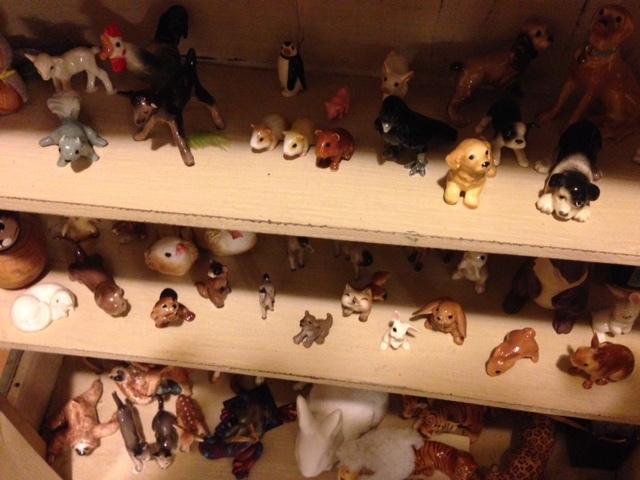 I collect miniature animals that represent the pets and other animals that have been important to me in my life. 15. Two of my short stories about my childhood with my grandmother have been published in a Journal – “Respect” and “You won’t forget, right?” My goal is to write my own book of short stories one day, soon. 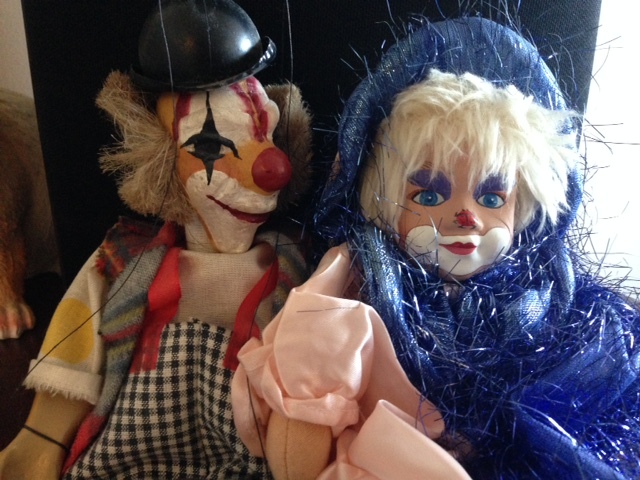 Now my clowns ask: Please share some things about yourself in the comments. We would like to learn more about you. This entry was posted in Reflections and tagged Chaplin, clowns, facts, Marquez, Montreal, random, volleyball. Bookmark the permalink. Rebecca, I loved reading this and getting to know you better. I hope you get to live in Quebec someday. #4 stood out to me above the rest. It shows what a caring, sensitive child you were and surely the adult you are. I’m glad I know you. If you write a book of short stories, I would love to read them. Eileen, thank you. I miss my younger self, the life she had and the person she was because of it. It has been challenging to find the time or the energy to write all these stories but so far I have 11 in mind. I am sure you can relate. My hope is that I can get to them soon and accomplish something. Marie, I hope you’ll share more things about yourself too! It’s nice to learn more about each other, aside from our cancer experiences. I LOVE B&W movies too! I just don’t take the time to watch them lately. I should get on that. Thanks for a great list!! I watched Modern Times last night, again, and it was fun. I get sick of a lot of movies today but I always appreciate an old film. Rebecca, I LOVED reading these wonderful facts about you and getting to know you better. #4 really moved me — what a kind, caring, sensitive person you are! “Of Love and Other Demons” will have to go on my ever-expanding to-read list. This was a great list, Rebecca. And whatever you publish, I would love to read! Beth, thank you for your kind words. It has been a lot of fun for me to learn more about my online friends as well. Wondering what ever happened to that little girl. A lot, I say. I feel like I am such a different person today, a lot more cautious and distrustful. Circumstances are a lot different today of course. I do miss the good old days. I think most of us do. Marquez has a lot of wonderful books. I wish I had your discipline. It’s taking me forever to focus on my stories. Wish me luck! Looking forward to reading the book of short stories you are planning to write. I admire and enjoy your writing. Thanks for including these fun facts. Thank you for your support, Rita. I appreciate it. I just need to find the time to focus and just get it done, before I forget all the wonderful childhood memories. I also love Charlie Chaplin. I use his movie, City Lights, when teaching English Language Learners all the time. Great list! Good to see you, Carrie. I love City Lights and many of his other movies. Buster Keaton was awesome too. Isn’t Montreal a lovely city? I think it’s interesting that you don’t have a cell phone. To be honest, I sort of miss the days when we weren’t distracted by technology. When I ride my train home I am the only person not staring at a phone. I don’t know, I kinda like my freedom. I bet you appreciate yours too. i do! I understand that it is very useful and when I travel I feel the need but I know myself if I have one I will be checking it (emails, social media etc.) all the time even when I am around people. I am inclined towards getting one soon but I think after your post I will choose a dumb phone – it may solve my problem of distraction! what a great solution! So enjoy learning more about my online friends. I am also not afraid of clowns, but my friend totally is. Love the dumb phone! LOL! #8 for me too. Kim, you talked a lot too?! lol Oh man, it would have been nice to have you as a friend. Yea, I love my dumb phone although it’s time for a new one (probably will get another dumb one). My friends don’t get it and they think I need intervention. If Puddles (http://www.puddlespityparty.com/) ever visits your city, I recommend you both see him, haha! He is great.